FRIDAY 5: She Wore It - becoming. And we want to lounge on it. Blue velvet sofas are in the house. Todd Romano, an interior designer with locations in NYC, Connecticut and Texas. His work has been featured in Architectural Digest, Departures, Elle Décor, House Beautiful, House & Garden, The New York Times, Southern Accents, Town & Country, Traditional Homes, and Lonny Magazine. 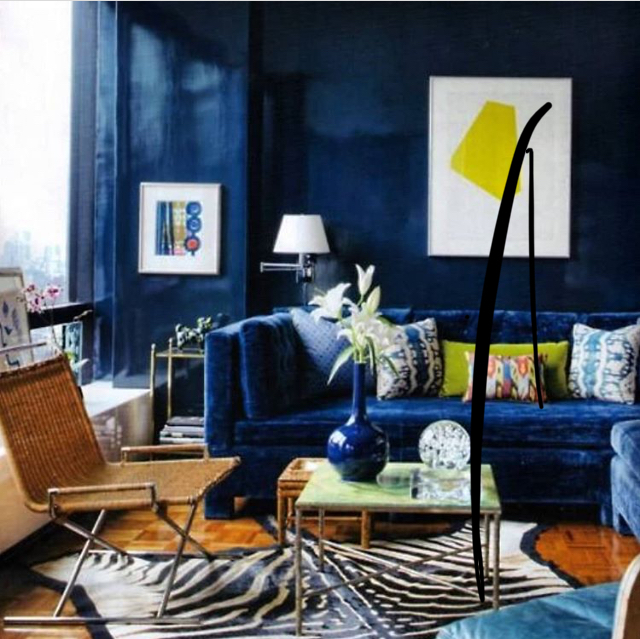 Why we love it?Deep blue as far as the eye can see with pops of color and textures to balance. So daring. Why we love it? That blue is so soothing and we love how it’s echoed in the artwork. The Morrocan table and the chair fabric add interesting touches. Who is it?@summerthorntondesign. Summer Thornton is based in Chicago, but does beautiful interior design work all over the country. She "is known for bold and colorful interiors that have been featured in House Beautiful, Traditional Home, Luxe Interiors+Design, Domino, Lonny, Modern Luxury Interiors and more." Why we love it? Technically it isn’t a sofa. It’s a banquette. But it’s velvet and it’s blue. And we love it. So, close enough. What a fantastically vibrant color and the contrast with the wall paper, artwork and red lampshades: brilliant. Moody Magpie is an interior designer in The Netherlands offering "high-end styling at down-to-earth prices." Why we love it? This is her living room and we wish she’d invite us over. We find the eclectic mix warm and inviting and love the color scheme. Who is it?We don’t know. Found on Instagram without a credit. But we loved it too much and had to share. Why we love it? It looks like a super cool loft apartment. It’s minimalist but cozy. The crazy paint job is intentional and it really works!